Kind of surprised this this hasn't been revived yet. So I did it myself. A lightning bolt shaped like a T. rex looks like it's going to bite out a lot of rock in Blue Mesa, Arizona. This is an interesting article about Mary Anning and how she contributed to paleotology in France. Here's a very interesting article that National Geograhpic has about Bolortsetseg “Bolor” Minjin teaching Mongolian children about their native dinosaurs. Here's an interesting article about Alamosaurus. The Philip J. Currie Dinosaur Museum is in big trouble, mostly due to it's remote location. Hatcher, the Smithsonian Museum's iconic Triceratops, will be 'fed' to a T. rex, which I'm pretty sure is the Wankel Rex/MOR-555. For those who don't know, the Triceratops is named after John Bell Hatcher, who found 50 Triceratops skulls and found the first remains of Torosaurus. Here's an interesting article about T. rex having feathers. Interesting read; I'm sure many scientists want feathered T. rex to take more prominence in the pop culture landscape. As far as feather distributions go, I don't think T. rex was as feathered as the Dromeosaurids, and we know that based on the sparse fossil skin impressions we found, originating from the animals belly, it was still partially scaled in certain areas such as the feet and jaws. After all, birds still have scaly feet, and beaks that aren't feathered in order to interact with the world or with their prey. Basically this. I'm not against how some are advocating for feathered theropods, but I don't like how many are rushing it to the point where they are somewhat shoving it down our throats, a la Mark Whitton. What people keep forgetting is that it takes time for change to occur. Robert Bakker didn't try to shove his views down people's throats. And his view were widely accepted because of that. And this is from somebody who loves that new feathered T. rex toy that Wild Safari put out. 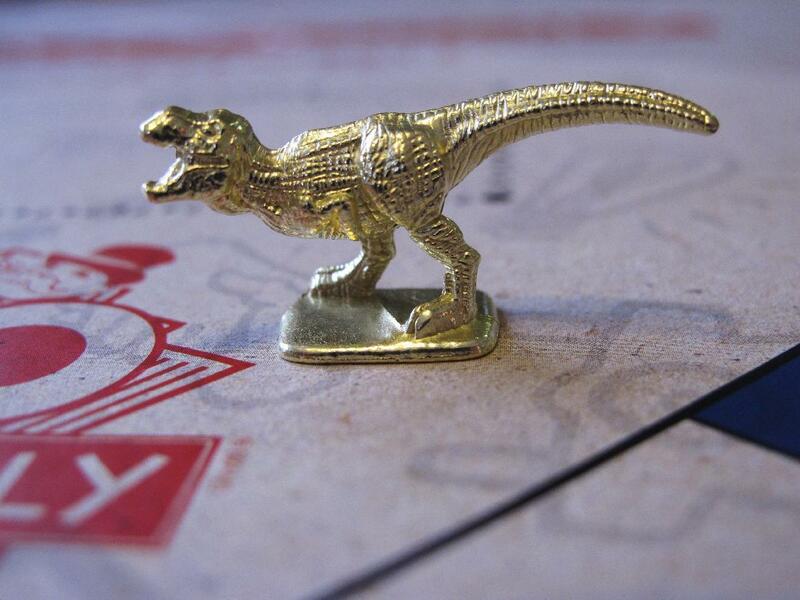 T. rex has become one of the new Monopoly pieces. Augustynolophus morissi could be the new state fossil of California. This article talks about how the abelisaurs took over South America, Africa, and Europe. Relevant to me because it's where I live. Given how tyranosaur fossils have been found in Canada before and how a tyrannosaur, Nanuqsaurus, was found in Alaska, I'm surprised that it took as long as it did before a tyrannosaur skull was found in British Columbia. The Smithsonian wrote a good article about Dueling Dinosaurs 2.0.t-he one with the Nanotyrannus skeleton. The least the one guy could do is let paleontologists study it for a certain amount of time like the owner of Willow the Thescelosaurus did. Update: Augustynolophus morrisi has officially become the state dinosaur of California. references to a Tyrannosaurus Rex, before they found the silly looking mutant version, with the little arms? What do you guys know about old dinosaur research, and, credo? There was no 'mutant version'. The arms of tyrannosaurids got smaller as the killing power was more focused on those powerful jaws. Scotty, one of the largest and most complete T. rex found, has become the Provincial Fossil of Saskatchewan and part of it's emblem. While not strictly related to paleontology, I just think that this is so incredibly detailed, life-like and ultimately just plain COOL. Jim Henson's Creature Shop delivered on a quality animatronic that could be compared to Stan Winston's best work on the Jurassic movies! If it were featured in a prehistoric creature horror film of some sort, as opposed to CGI, it could be just as terrifying as any animatronic movie monster. That does look pretty cool. The last time I remember a Smildon looking that life like in ANY movie was Sinbad and The Eye Of The Tiger. Other then making the 'super-teeth' thicker, that would be roughly the same design that I have in mind via my take on Creation. The Kansas University Natural History Museum has a 14 foot long juvenile T. rex on display next to a full grown one until Dec 31. That is actually pretty cool. Location : In my den, rubbing my hands together and laughing maniacally. I'm surprised nobody's said anything about the "dinosaur" (note the quotation marks) carcass found in India with flesh still on its bones. Are you interested in a text-based Jurassic World: Fallen Kingdom roleplay centered on Isla Nublar? Vote here! This is sad. Brian Franczak really has gone downhill since his prime in the late 1980's-1990's. And he's one of my all time favorite dinosaur artist as well. So tragic, even more so considering how he's just 62.